Youth Gathering on MMIWG – Southern Chiefs' Organization Inc.
Southern Chiefs’ Organization (SCO) will be hosting a free event for youth that are family members of Manitoba’s missing and murdered Indigenous women and girls (MMIWG) or those that are affected by the issue. This event which is a collaboration between SCO’s Justice department, Long Plain First Nation and Manitoba Victim Services will take place in Portage La Prairie on Wednesday, March 27 and Thursday, March 28, 2019. We encourage youth ages 16 to 25 from SCO’s member communities to register for this special event (space is limited and we will be capping registration at 30 people) that will offer young people the opportunity to share, learn more about resources available to them, and how to support others (both emotionally and culturally) as part of our collective healing journey. Additional information on agenda, travel logistics, etc. 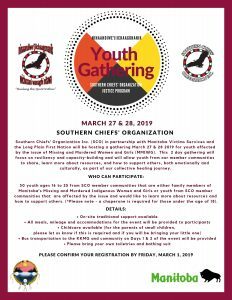 can be forwarded to Nicole Everett, Violence Prevention & Safety Coordinator, at the Southern Chiefs Organization, at: (204) 946-1869 or nicole.everett@scoinc.mb.ca.